A Tonk's Tail... err, Tale...: Cat Daddy Giveaway Winner! Nice one and have a great evening. Concatulations to the Furries of Whispy! They is really happy! Congrats to Whispy! We guess we're gonna hafta get our mom to buy this book!! Congrats to Whisppy :D Enjoy the book! Concats to Whisppy! They are such nice folks over there. We are happy for them. YAY FOR WHISPPY!! 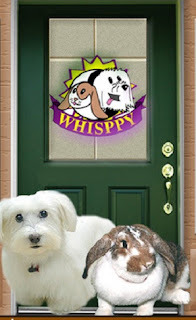 !So happy, we LOVE WHISPPY!!! They are gonna love this book...wow did you guys see the show last night? Some scary kitties on there for sure!